John Joseph O'Neill, usually referred to as Captain O'Neill, was born on August 14, 1833, at Glengarriff, Cork County, Ireland. He had emigrated to Canada and later married Ellen Butler in 1872. Ellen was born March 9, 1852, in Tipperary County, Ireland. She was the daughter of John Butler and Mary Shea. Captain O'Neill and Ellen lived in Deloro Village until 1884 before moving to Marmora. Captain O'Neill was one of the first mining developers of Deloro and Cordova Gold Mines. Just prior to 1893, Captain John J. O'Neill had purchased the corner property belonging to Doctor L . E. Pomeroy. On the property stood a small frame building which was used as an office for his medical practice. Behind the office was his red brick residence which faced Matthew Street. By 1893, Doctor Pomeroy had moved his medical practice into Stewart's Drug store further north on Forsyth Street. On March 24, 1900, fire destroyed the block, which housed Mark Keyfetz general store, David Lavine & Co. and the hardware storeof Francis Carscallen (1875- 1907) Immediately thereafter, Captain O'Neill had all the existing buildings torn down. In its place he built a two-storey building. The building had separate apartments upstairs and separate business stores on the Main floor. In 1902, David Lavine & Co. occupied the northern half, later, before 1908, leased to the Sovereign Bank of Canada which had just moved out of the building (Old Legion Hall) at the end of McGill Street. The southern half of the building was operated as a Hardware Store. The Sovereign Bank's first manager in Marmora was Mr. Beaton who left in 1906 after serving a year, for a new branch in Montreal . His replacement was W. G. Avery from England who hired James Parker as his assistant. James Parker was the son of Robert Parker and Namah Chard. James would later become the senior judge for York County, a position he held from May, 1931 until November, 1948. James had first worked at A. W. Carscallen's private bank, located at 53 Forsyth Street. The Sovereign Bank had taken over Mr. Carscallen's bank shortly after his death in February 1907. He also had a summer home at Crowe Lake and owned most of the property around Marble Point at the time. On January 17, 1908, the Sovereign Bank of Canada closed its doors for the last time and reopened on January 18, 1908 as the Dominion Bank. The failure of the Sovereign Bank was due to large investments being made in American securities and the fact that most depositors had already withdrawn their funds shortly after the bank's affairs had been after investigated in May, 1907. The new Dominion Bank would stay in the northern half of the O'Neill Building until 1951. The Dominion Bank first obtained its charter in June, 1869, butwaiteduntil February 1st, 1871, before opening its firstbranch office. Until 1897, the Dominion Bank had been anOntario institution. However, branches were opened in Winnipeg in 1897 and in Montreal in 1898. By 1915, over ninety-five branches had been opened throughout Canada. In 1908, the staff of the new Dominion Bank consisted of one teller, one bookkeeper, one assistant and the Bank Manager. An employee from one of these positions was required to live in the apartment located directly over the bank. The reason for this was that a huge hole had been cut in the metal ceiling panels located over the vault doors and this large hole is still visible in the ceiling of the Historical Foundation. From this vantage point and using the bank's hand-held revolver, the would-be bank robbers could be fired upon after working hours. 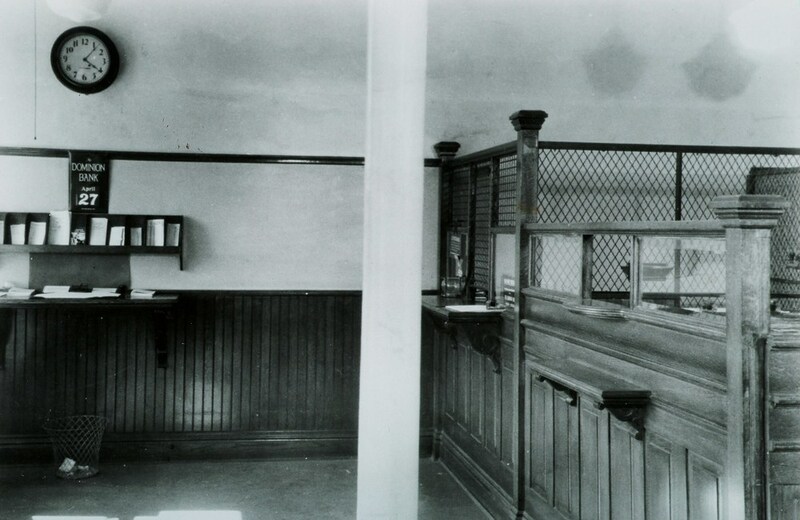 The bank was heated by a coal stove which stood in the center of the bank. The manager's office was located near the south front window overlooking Forsyth Street, .where Archives our cat still keeps an eye on the comings and goings on Forsyth Street. At some point, W.E. "Glad" Murphy was manager of the Dominion Bank as noted in the article on the right. It appears Mr. Murphy became "one of the best Argonaut Rugby players"! Walter Watts was the manager of the Dominion Bank from 1913 to 1915. He was reported to have forwarded the proceeds from the Patriotic Tea to the war front, and a letter from the British American Company, London, England stated that 7,500 Players cigarettes have been distributed among the soldiers and labelled as a gift from the Village of Marmora. (During his absence in 1915, Mr. S..L. Reade of Berlin acted as manager.) Also in 1915, a certain Mr. Holt from Bath was hired as a junior member of the staff, in place of Monto Bertrand. On Nov. 25, 1915, Mr. Watts was transferred to Huntsville, and William Smythe, a former bank teller in London was appointed the new manager. He didn't last long, as the Herald reported In Jan. 1916 "Mr. W.A. Fisher was the manager, living in the Old Gordon McWilliams residence on Bursthal Street." In March of 1921, they reported Mr. M.E. Grant, formerly an accountant for the Dominion Bank in Orillia, became manager of the Dominion Bank. He, too, took up residence in the McWilliams home. During Mr. Grant's absences, a teller, by the name of Milton Chesney, acted as manager.
" The first woman ever to work as a teller at the Toronto Dominion Bank in Marmora passed away in Pickering, Ontario , on July 8 in her 97th year. Mrs Mary Reid is survived by her husband, Thomas J. Reid and children, Mrs. Mary Vodden, Sister Margaret Reid and Thomas Reid "
Marilyn Maloney, who worked with Alex Fraser remembers: " It was, in those days, a scary place as most banks were. There was one tellers cage, the upper half enclosed with a "chicken wire" as we called it. Michael Forestell was the teller. The hand written ledgers were updated daily and maintained by Lena Sullivan and Dorothy Airhart. Alex Fraser was the Manager. "This was like it was when I started working there in 1963 under Manager Mr Glen Wentworth. I started as the Ledger Machine Operator and worked my way up to head teller which was behind the first wicket. Two other tellers were at the back, manager and asst manager desks were up front . I worked with Toni Blasko, Alice Stark, Marilyn Maloney and Jeanne Robinson. Loved the work and the people I worked with." Businesses that followed at 32 Forsyth Street included Holmes Furniture Store, Cassidy Furniture and Appliances, Lorraine’s Jewellery owned by Lorraine and Ron Henry, "The Gift Shoppe" owned and operated by June Vilneff from 1971-1993, and"Hastings Handcrafts" run by Judy Backus until 1999. As of Aug. 1, 2001, it has housed the Marmora historical Foundation.
" Reeve F.N Marett and T.W. Rhind, manager of the Dominion Bank here, went to Toronto to interview officials at the Head Office of the Dominion Bank in regard to an increased line of credit for Marmora Village. They were successful in their mission and the school teachers will now be paid in full up to May 1st. The Village will also be able to meet debentures as they come due and other payments. The Bank officials urged the necessity of the utmost economy in connection with village affairs and the schools at the present time, and also strongly recommend an increased tax rate to help retire the village loans.". 1938 saw renovations completed. Walls and ceiling were painted, the woodwork varnished, and the metal grill from the ledger Keeper's desk to the manager's office had been removed.